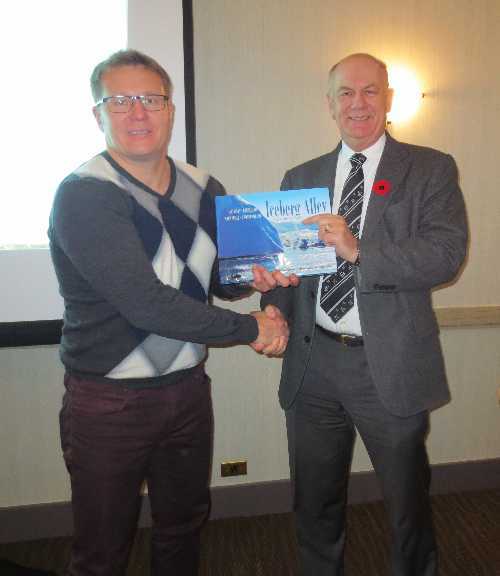 December: Sudhir Pai wrapped up our 2014 luncheons on December 20 with his presentation on the autonomous marine vehicle, Wave Glider. Sudhir is Vice President of Liquid Robotics Oil and Gas, a joint venture with Schlumberger. in the Canadian Arctic and Northwest Greenland. 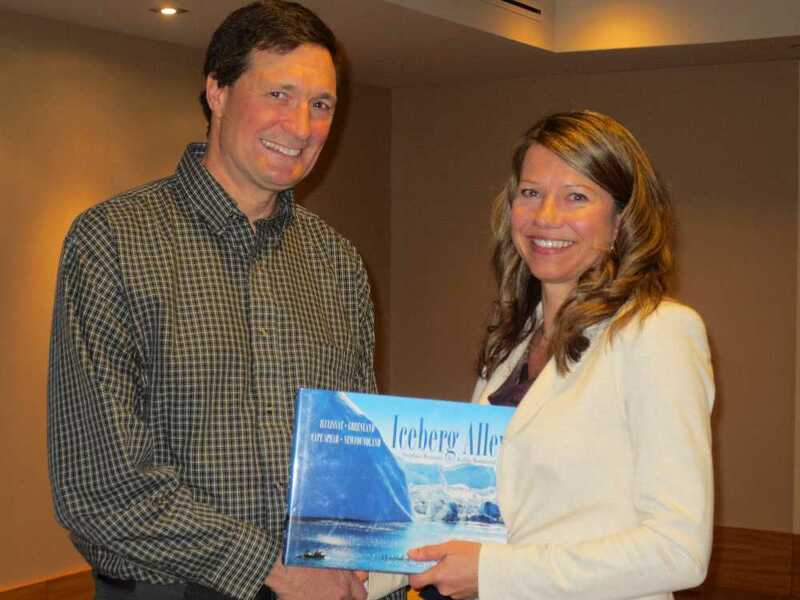 Karen Muggeridge presented the Arctic Section's thank you gift. 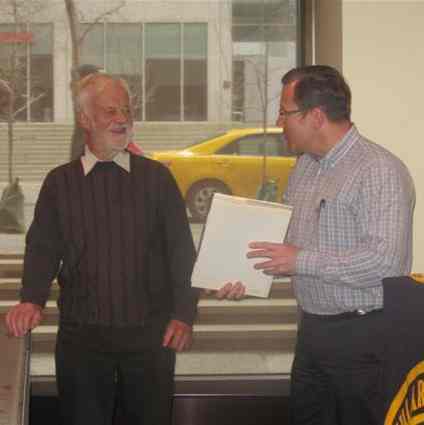 September: Len Maier, currently retired, formerly Halliburton's VP of International Operations, presented Killing the World's Most Northerly Blowout at the Westin on September 17. 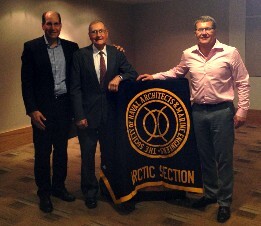 Pictured here (left to right): Ron Maier, Len Maier, and Alex Brovkin. 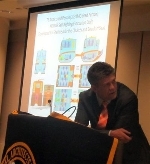 May: Bruce Seligman of ARKTOS presented an overview of ARKTOS development on May 21. Bruce called on the audience to discuss existing or new evacuation challenges. April: On April 16, Bastiaan Lammers (Boskalis) and Gerry Sarlis (Dockwise) gave a joint presentation on Integrated Marine Approach for Preparation, Transport and Installation Operations in the Arctic. 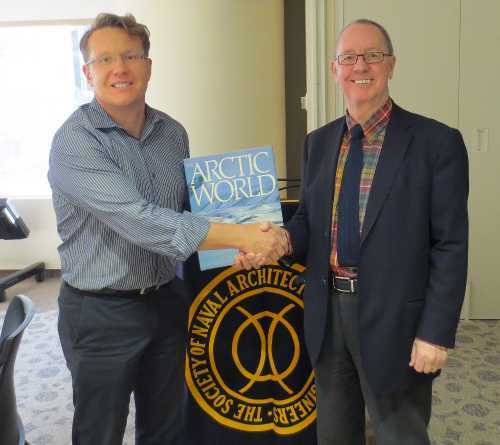 March: Roger Pilkington spoke on Arctic Offshore Development Concepts - History and Evolution on March 16 at the Westin. January: In The Base for the Beaufort on January 16, Doug Matthews addressed the opportunities and challenges of a Tuk port.